John Ging, Operations Director for the UN Office for the Coordination of Humanitarian Affairs (OCHA) briefs the press. At left is Stéphane Dujarric, spokesperson for the Secretary-General. Beset by multiple crises themselves, Niger and Chad are making heroic efforts to cope with the impact of the turmoil swirling around them, but the international community is failing in its responsibility to share the burden, a senior official for the United Nations Office for the Coordination of Humanitarian Affairs (OCHA) said today. Briefing reporters at UN Headquarters in New York after his return from the two countries, OCHA Operations Director John Ging noted that between them, Chad and Niger host more than 850,000 refugees and returnees from neighbouring countries. “These two countries constitute a fragile island of stability in a region of conflict. Impoverished as they are, they show us their exemplary humanity in opening their borders to hundreds of thousands of refugees fleeing their war-torn neighbours: Nigeria, Central African Republic, Mali, Libya and Sudan,” said Mr. Ging. Beset by multiple, overlapping crises driven by a harsh and worsening climate, acute poverty and minimal infrastructure, Niger and Chad now face large-scale population inflows, cross-border attacks and the economic impact of closed borders. “Of the many countries I have visited over the past year, Niger and Chad offer the clearest examples showing that urgent action is required to meet basic needs and shore up stability to prevent these fragile countries from tipping into crisis,” said Mr. Ging. 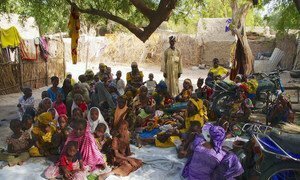 Niger is ranked last on the UN’s Human Development Index, while Chad falls fourth from last. 2.4 million people in Chad and 2.6 million in Niger are food insecure. Niger’s population, with two thirds of its citizens aged under 25, is one of the fastest-growing in the world, and the population is set to double every 18 years, expected to reach 200 million in 2050 from 18 million currently. Both countries’ humanitarian appeals are woefully underfunded, at 17 per cent for Chad and 25 per cent for Niger, and contributions are declining both in absolute terms and as a proportion of need year-on-year. The members of the United Nations Security Council condemned today in the strongest terms the spate of recent terrorist attacks perpetrated by Boko Haram in northeast Nigeria and Chad.